LISTEN. SPEAK OUT. AND INTERACT as we are now heading to reach a certain consensus. Junior Political Economists' Guild in partnership with the Office of the Student Regent proudly presents its National Summit 2018 entitled Federalism: Weighing Interests, Reaching Consensus. 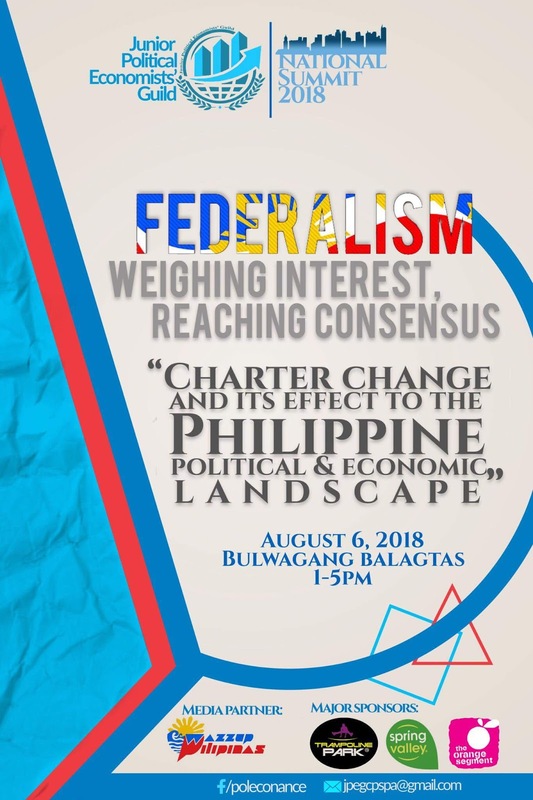 Charter Change and Its Effect to the Philippine Political and Economic Landscape on August 06, 2018 from 1PM to 5PM at Bulwagang Balagtas, Polytechnic University of the Philippines. #NatSum2018 aims to convene students from different universities to hear significant updates, stage inquiries and reach consensus on matters concerning Charter Change. Likewise, it aims to inspire the youth to become a rational part of the system— capable of making a stand on public issues and concern. It's the perfect time to go beyond the four walls of theories and explore the reality!